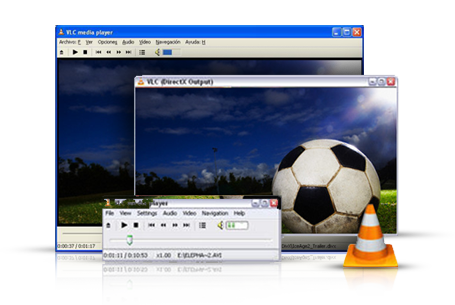 VLC Media Player 2.0.7 Download and Install for Windows and Mac OS X Operating Systems (32-bit, 64bit).Also web browser plugins for Mac OS X.VLC (initially VideoLAN Client) is a highly portable multimedia player for various audio and video formats, including MPEG-1, MPEG-2, MPEG-4, DivX, MP3, and OGG, as well as for DVDs, VCDs, and various streaming protocols. It also can be used as a server for unicast or multicast streams in IPv4 or IPv6 on a high-bandwidth network. VLC Media Player 2 is a major new upgrade and the first (major) upgrade since the original launch. New features include faster decoding, a new rendering pipepline and, for Mac users, a brand new user-interface. 2.0.7 also fixes and important regression in decoding numerous audio file formats and when encoding in MP3 and AAC. Operating systems: Windows XP, Windows Vista, Win 7, Win 8, Mac OS X.